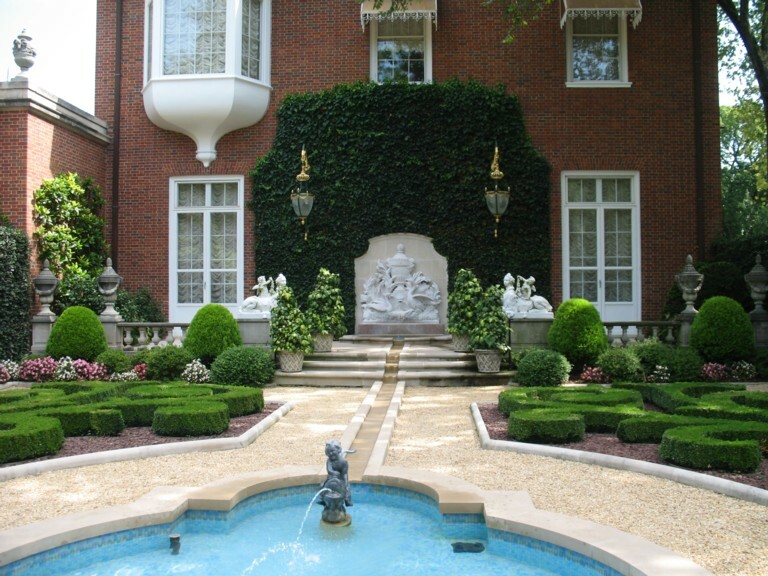 One of the things I love about travelling to the eastern part of the USA is visiting some of the “stately” homes of the very rich which have been opened for public view for one reason or another. 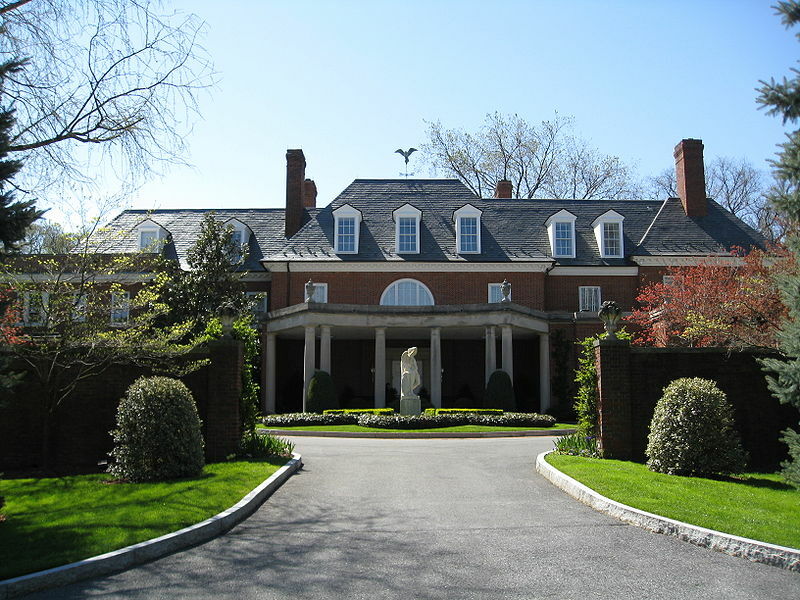 The Hudson Valley was the location of the country homes of many wealthy New York industrialists such as the Rockefellers and the Vanderbilts, as well as old moneyed families such as the Roosevelts. So over the years I have found great interest and pleasure in touring these and seeing how the “other half” lived in former years. 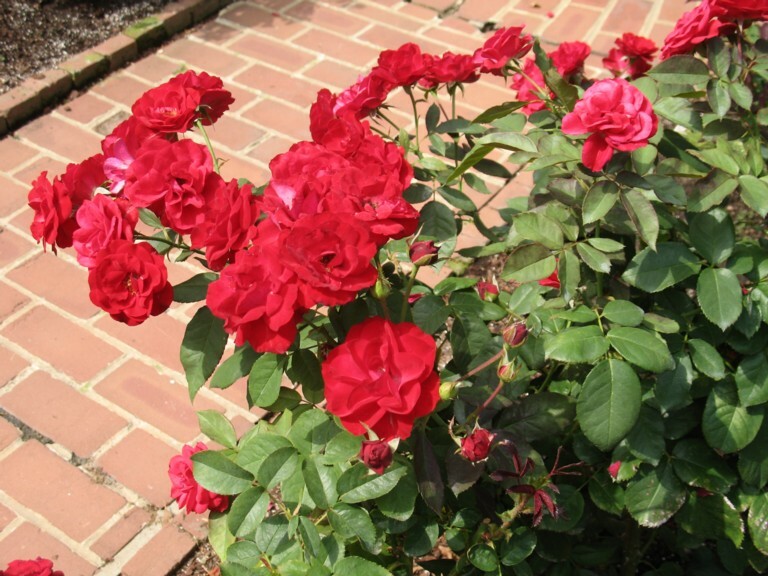 Washington DC is home to such an estate, but from the moment in 1955 when Marjorie Merriweather Post bought the 25 acre estate, which she renamed Hillwood, she always intended it to be a museum as well as her home. At 27 she inherited the Postum Cereal Company, which later became the General Foods Corporation, making her one of the wealthiest women in America. As she took her place in the cosmopolitan circles in Manhattan her passion for the arts began and she began to seriously collect French decorative arts in 1919. A view from the French Parterre garden towards the house. But her other lifelong passion, Russian imperial art, began when she was the wife of the United States Ambassador in Moscow, Joseph E Davies, in 1937-38. She assembled the beginnings of her collection at that time, perhaps one tenth of it, finally building perhaps the finest Russian collection of icons, gold and silver pieces, porcelain and Faberge eggs outside of the country itself. On her death in 1973 this house became the museum she had always planned so that others could share her treasures. Touring the house and gardens is very well organized, starting with an introductory film and you can either join a guided tour or at your leisure roam both, with the aid of an audio device. We chose the guided tour of the house which lasted about an hour and a half. No cameras allowed inside unfortunately so I will have to point you to their site if you would like to see some of the wonderful things the museum houses. Many of her Russian things are not only objects of beauty but have wonderful historical significance. The Icon Room houses objects of silver and gold, often liturgical pieces, and over 80 pieces made by Fabergé, including two of the famous imperial Easter eggs. The crown worn by Empress Alexandra at her wedding to Nicholas II is also part of this collection but probably the most stunning and valuable piece is the Buch Chalice which was commissioned by Catherine the Great for her local parish church and for which she provided all the gold and jewels used in its making. Her collection of porcelain, both Russian and French, is outstanding and many of her guests were treated to dinner on these various services. She had a special love for 18th century blue Sèvres porcelain which she collected for many years. Mrs Post’s bedroom suite formed part of the tour and there she had breakfast and dealt with her correspondence and consulted with staff members. Many of her clothes along with some of her jewellery were on display and it brought home to me that this woman actually lived among these treasures that she had lovingly collected over many years. 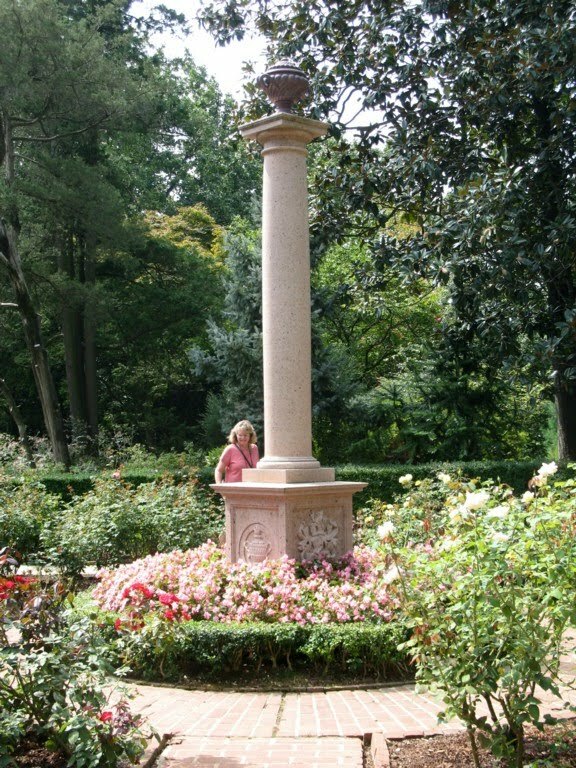 Later we wandered the beautiful gardens which are divided into various areas. 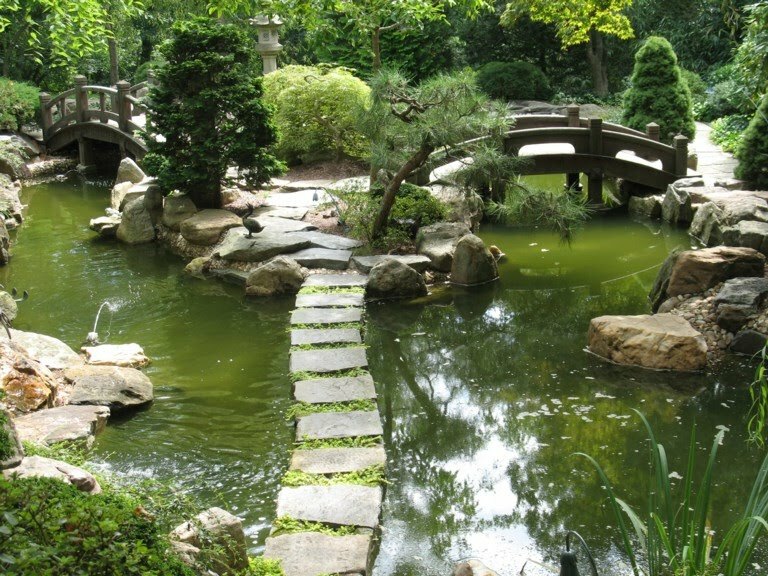 Probably one of the most popular gardens there is the Japanese style garden constructed in the late 1950s. 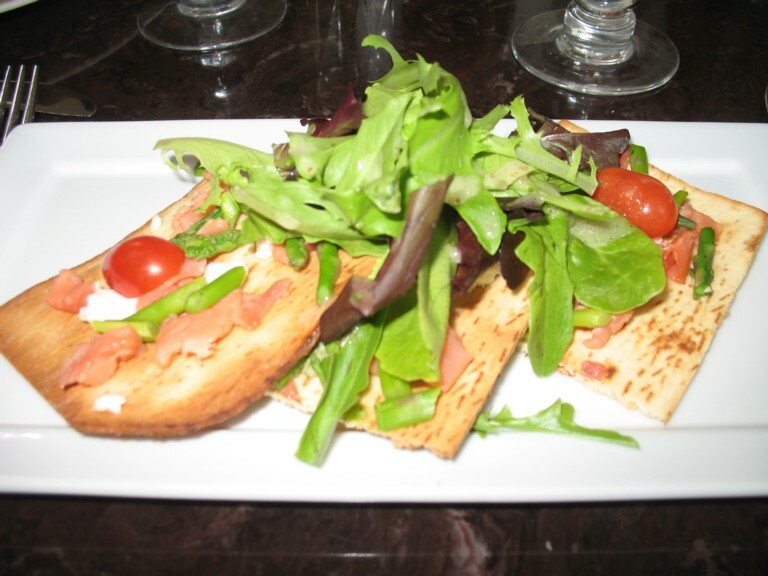 As they say, it is a blending of the Japanese traditions and American taste. It was constructed on the side of a hill with many different levels and separate vistas. 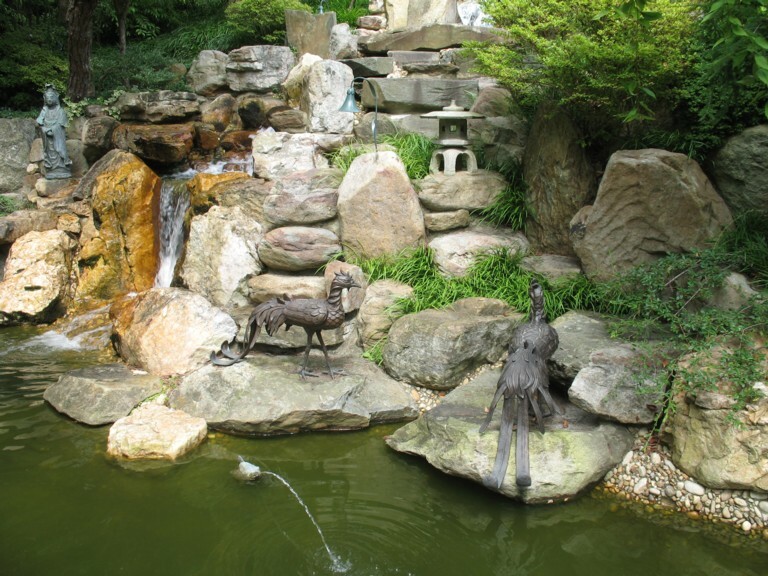 There seem to be a surfeit of statuary and sculptures in amongst the plants and rock as apparently Mrs Post continued to add them even after the garden was officially finished. 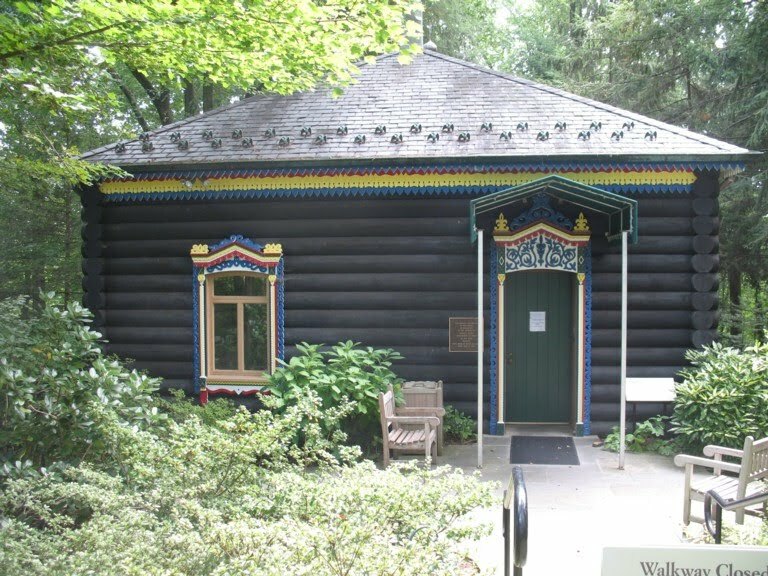 This copy of a Russian dacha, or one room summer house, was built in 1969 and is charmingly set in an azalea garden which must be quite the sight in Spring. Oh did I tell you that we ate lunch there too? At a charming café in the gardens. Salmon with goat cheese and mini asparagus. Delicious. And of course I bought a book about the place as well. If you ever go to Washington DC and can tear yourself away from the Smithsonian, I can most highly recommend that you visit Hillwood. I often give a lift to a friend who does not drive and she gives me little gifts of appreciation. This charming one is made of glass, twisted for sure and moulded into this very lovely flower. 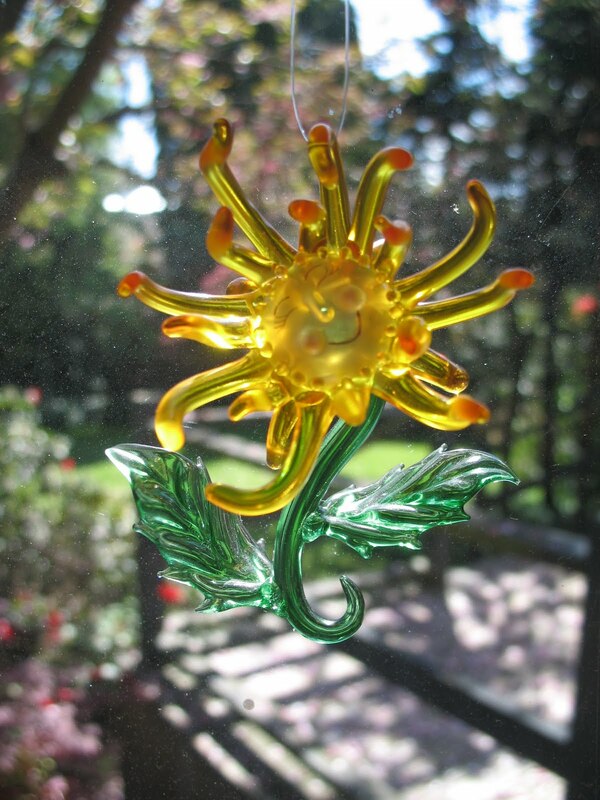 It hangs in my kitchen window and catches the morning sun which makes it glow with colour. Funnily enough this is the second time for twisted in Photo Hunt and I had three beauties last time. Well this one’s a real hard hat ‘political’ type post. It ought to get people thinking, maybe riled. But I do wonder if many people will read it, or comment. Chances are it will be published while I am away anyway, so if I don’t reply to any comments ’till much later I apologise now. These are really questions, but they go to the heart of how we live, our assumptions. I don’t have a strong point of view in this. This is more to see what other people think. A couple of things prompted me to do this post. Firstly I was watching a documentary on TV about 9/11 the terrorist attack, on the twin towers especially. It brought back a lot of the horror of it, the surreal unbelievable nature of it. There was understandable anger amongst people on the streets that day a desire to strike back somehow. One guy interviewed said that Finland should be bombed in revenge. He had on a business suit. I guess he must have done a job that needed at least some smarts, but he was so incredibly ignorant he would have bombed Finland. I replayed it to double check, no mistake. I thought incredulously to myself “Just as well he is not secretary of state for defense” then I thought “…and he is allowed to vote?” Tho, to be fair, I figure maybe he had an excuse to be a little mixed up, even so… Finland? Something else. We are all pretty much aware of the huge fuss over President Obama’s health care plans. Now I am not going to go into that, for or, against. One thing that struck me was how the Republican “Anti” camp tried to use Stephen Hawking as an argument against the plans. Again the ignorance is staggering, and from a journal that people are supposed to take advice from, to listen to. Hawking was born in the UK. He grew up under its national health Service. He clearly did have a chance. It clearly didn’t say he was essentially worthless. It just about proves the opposite of what the writer was arguing. Viewing the attack has now been understandably restricted, probably re written too, if they have any sense. I figure the person who wrote that article is probably pretty smart and quite ‘political’ but is clearly a lazy enough thinker to make a bad mistake and clearly essentially ignorant of at least some very salient facts. It sent them in the opposite direction they wanted to go in. Or maybe they are a secret Democrat sympathiser. I guess that writer too is probably allowed to vote. If the rest of their thinking is as informed as the comments on Stephen Hawking then goodness help us all. So, a question. Voting is important. If you don’t have a clue and can’t be bothered to get one do you really have any business voting? I figure voters ought to have some knowledge, because when you vote you have your hand on the steering wheel of the great bus of state. Most places expect drivers to know what they are doing, to get a licence. And should it just be limited to ordinary voting? How about being a politician? Their votes are even more important. Voting on legislation is part of their job. They ought to have some knowledge. Surely they are more like airline pilots. They make a mistake and we all get to pay for it. Then I thought about the money side of things. Now If a bunch of people were planning to do something and were all paying towards it they would not expect to have to let other people who were not contributing to have a say in it. So why should people who don’t pay any tax get to vote on what tax money is spent on? OK I know it is not quite as simple as that in rl, what about housewives raising kids for instance? Would it would be better if you had to do a general competency to vote exam that every citizen had to take? How about if you only got to pay taxes if you voted and could only vote if you paid taxes. If it was based on income/ability to pay and was the only form of tax allowed by law? After our tour of the White House, we wandered along the Mall and decided to visit the National Museum of American History which is one of the 90 museums which make up the Smithsonian. We had not visited it on our previous trip and as we wandered in we found a tour about to begin of the highlights so quickly attached ourselves to it. It is a huge building, with three storeys and it recently was redesigned and underwent an $85 million renovation. One enters from the National Mall into a huge light filled central atrium which is a public space for performance and entertainment, with a stunning abstract representation of a waving flag, made up of 960 mirrored panels which sparkle in the light. It struck me as being a very eclectic museum in many ways but perhaps that is the nature of a tour which hits only the highlights. On the other hand perhaps it is not meant to be a comprehensive museum but give a flavour of what the United States of America has been all about in the past. 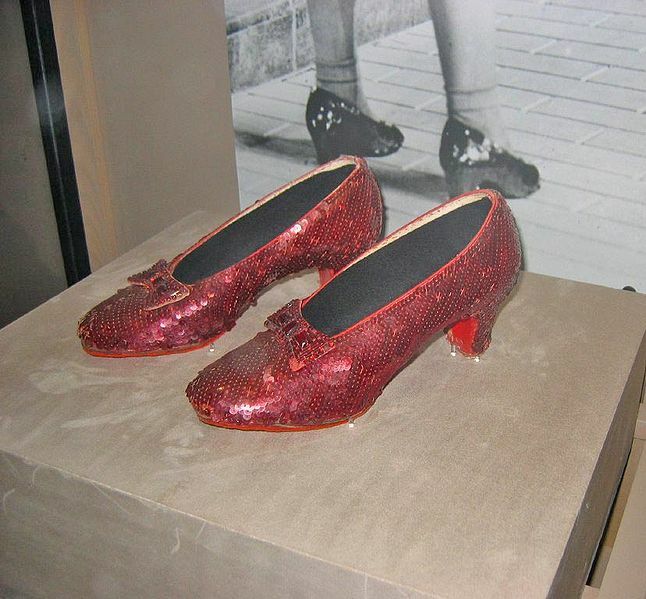 Among the things we were shown on this tour were Dorothy’s original Ruby Red slippers from the Wizard of Oz, above; a pair of boxing gloves belonging to Muhammad Ali, the most famous heavyweight champion of the world; the hat Lincoln wore to the Ford’s Theatre the night he was assassinated; the portable writing desk that Thomas Jefferson used to pen the Declaration of Independence; a collection of First Ladies’ gowns, a very early Teddy bear. Well you get the picture. A highlights tour. But perhaps you might be interested in one or two of the items we saw in a little more detail. We all know that teddy bears are named after Teddy Roosevelt, or more formally Theodore Roosevelt, the 26th President of the United States of America. He was also known for his love of hunting and this is the story the docent told us. In 1902 President Theodore Roosevelt was on a hunting trip in Mississippi. As reported in the Washington Post, the presidential hunting party. trailed and lassoed a lean, black bear, then tied it to a tree. The president was summoned, but when he arrived on the scene he refused to shoot the tied and exhausted bear, considering it to be unsportsmanlike. The next day there was a cartoon in the Washington Post about the incident and a shopkeeper placed in his window two bears made by his wife and called them Teddy’s bears. A huge hit, this humble beginning grew into the Ideal Novelty and Toy Company and eventually the name became simply teddy bear. 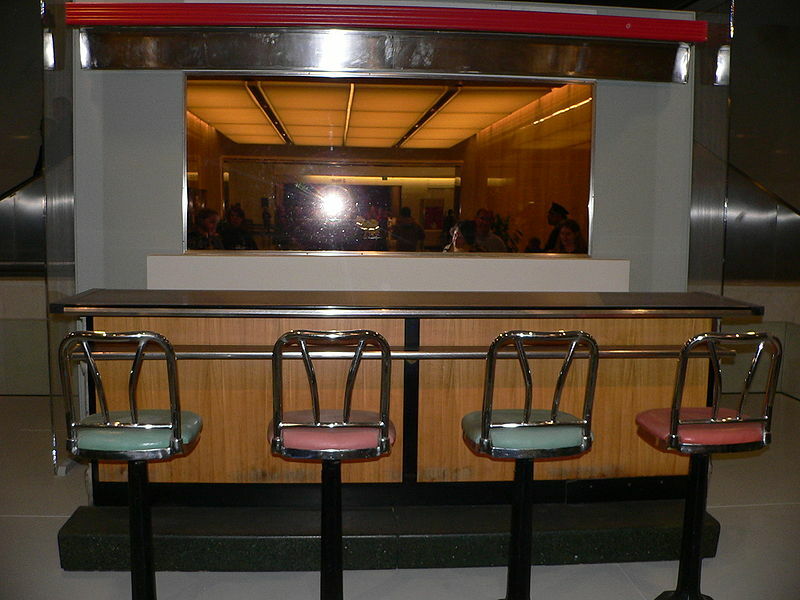 In our later wanderings we came upon a performance in front of this exhibit, a part of the dining counter from the Greensboro Woolworths store. A young African American held a group of people spellbound as he told them of an incident during the Civil Rights movement. On February 1st 1960, four young black students sat at the whites only dining counter in Woolworths in the town of Greensboro. They were not served, nor were they removed. Each day the protests grew larger until on the fifth day, 300 students arrived to demonstrate. These were not without incident but other towns joined the protests and eventually an impact was made, with Woolworths desegregating the counter several months later. 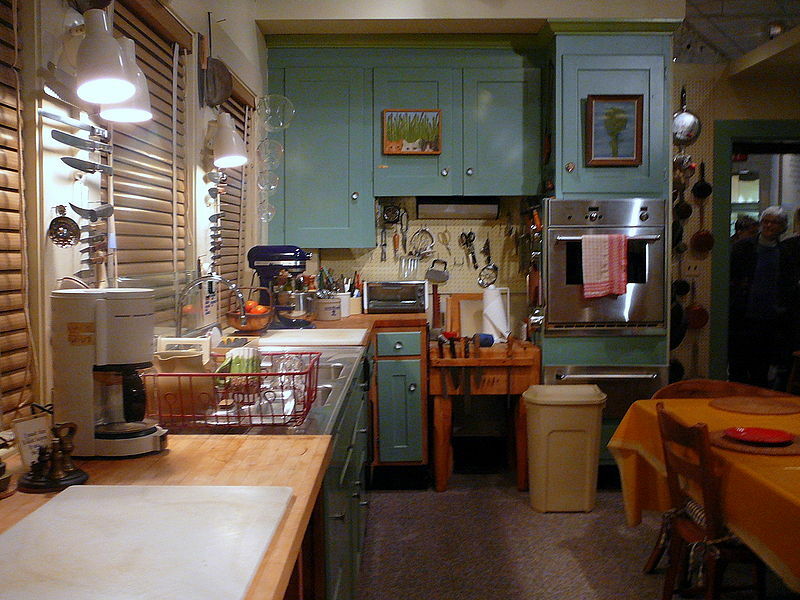 A very popular exhibit in this museum is Julia Child’s kitchen from her house and where all her TV shows were filmed. In 2001 Julia donated this 40 year old kitchen to the Smithsonian and while it was very interesting in its own way, the really interesting displays for me were films showing on various TVs in which she talked about some of the various tools in her kitchen, mostly acquired in Europe. One delightful segment talked about knives and what she considered the essential ones were, although she kept adding them and taking them away and laughing all the while. I can’t say I ever cared for her on TV although she was mostly popular in the years when we did not have a television set, but these small films taken in her old age were like a delightful visit with a very charming lady. The recent delightful movie, Julie and Julia, had some scenes filmed in the Smithsonian kitchen of Julia Child to add to its authenticity. I think many believe that the jewel in the crown of this museum is the Star Spangled Banner, a flag which flew over Fort McHenry in Baltimore Harbour during the war against the British in 1812. 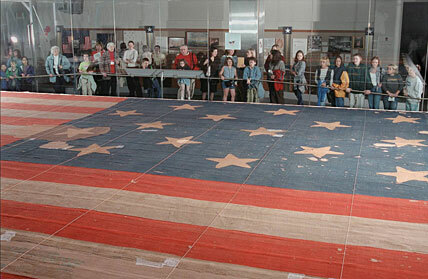 This huge flag, originally 30 by 42 feet, with 15 stripes and 15 stars, inspired Francis Scott Key to pen the poem which eventually became the national anthem of the United States of America. It has undergone various restoration attempts over the years but the latest in 1999 is simply an attempt to conserve what remains of the original, which is now only 30 by 34 feet, and only has 14 stars. It is displayed in a controlled atmosphere room to protect the fragile wool and cotton flag. 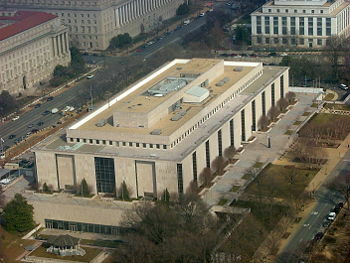 There is much else to see of interest in this museum but I’ll leave it for you to discover for yourself if you ever go to Washington, DC. I certainly don’t feel that I have by any means exhausted that fascinating place, museum freak that I am. My friend, who has been there for almost nine months, is wailing that their stay is almost over and she has so much still left to see. I’m sure she’ll give it her best shot. I am sure if I had time I could come up with a better upside-down photo for this theme but I don’t, so I am stretching it so far it might even break. 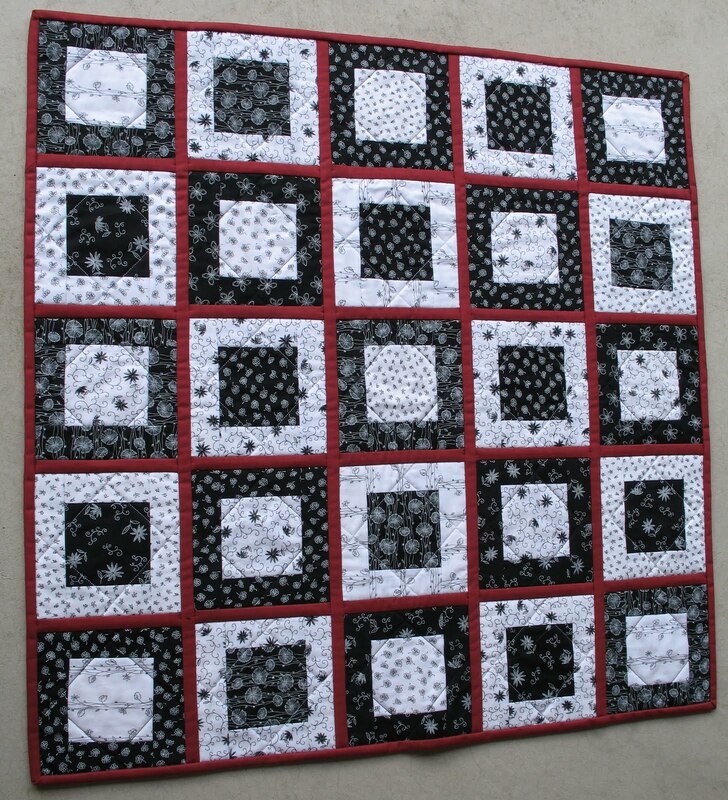 This is a reversible quilt I made some time ago and probably have shown before, which is the same upside down as right side up. 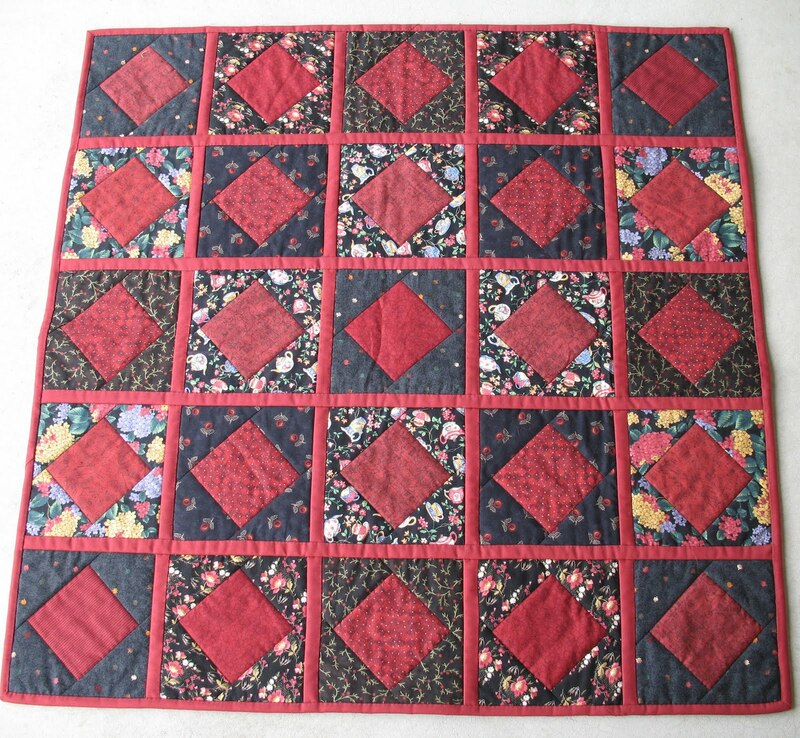 And the red back is the same whichever side you put up or down as it is completely symmetrical. So yes it is lame and I am looking forward to your bright ideas. Well I am back, just, for this week’s photo hunt. Nothing in the archives vaguely electrical except for some electric blue flowers. 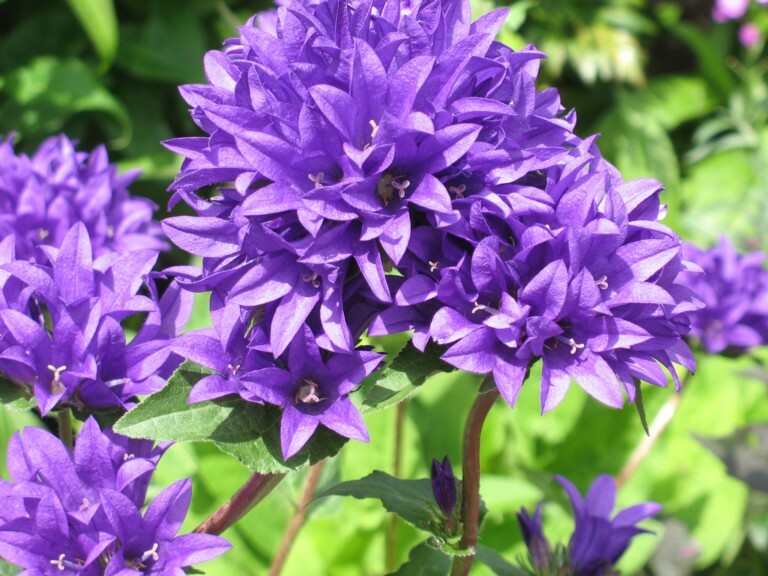 I have probably posted them for blue or some other hunt and I can’t even remember what they were called. Put it down to jetlag. Today is September 11th. Let’s remember those who died on that infamous day, 9/11/2001: approximately 2669 Americans and 329 foreign nationals from 52 different countries lost their lives in the attacks. 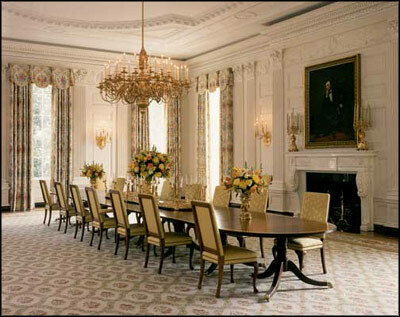 Only a few public rooms of the White House are included on the tour which is to be expected. But let me begin with a few facts about the house. It is the oldest public building in Washington DC and every president except George Washington has conducted business there. Although it has undergone many changes the basic structure, which was begun in 1792, has been kept. It was not occupied until 1800 when John Adams did so after the capital was moved from Philadelphia to Washington, DC, even though the building’s interior was not completed at that time. 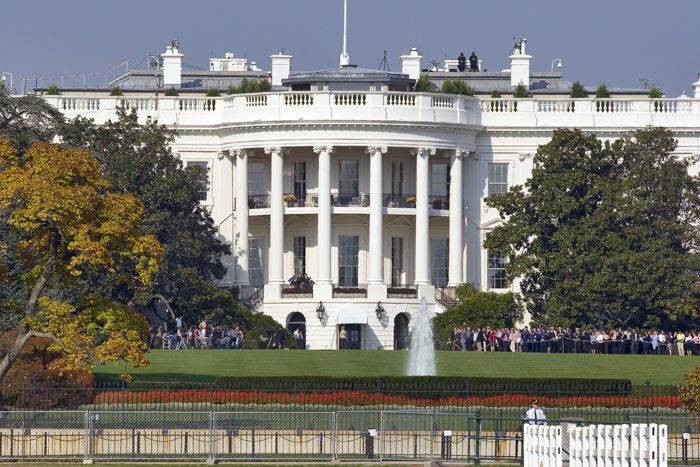 Prior to Theodore Roosevelt’s presidency the house was known as the Executive Mansion or the President’s House but in 1901 Roosevelt made its popular name, the White House, its official name and so it has remained since. 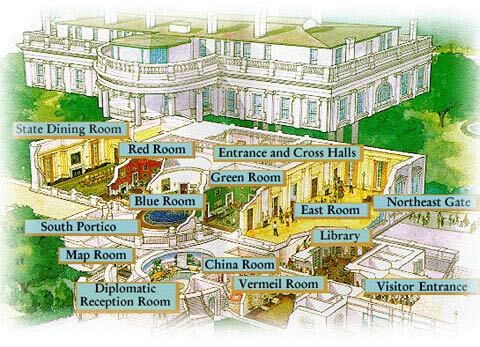 I think everyone knows that the West Wing contains the executive offices or official offices of the President, including the Oval office which was built in 1909 and just outside is the well known Rose Garden built in 1913. None of this was included in the tour however. The first three rooms on the tour were not entered by the group, although they would have been quite interesting to see in a leisurely fashion. Their size and location prohibited entry and besides the information given by the guide only a quick peak through the door was available. 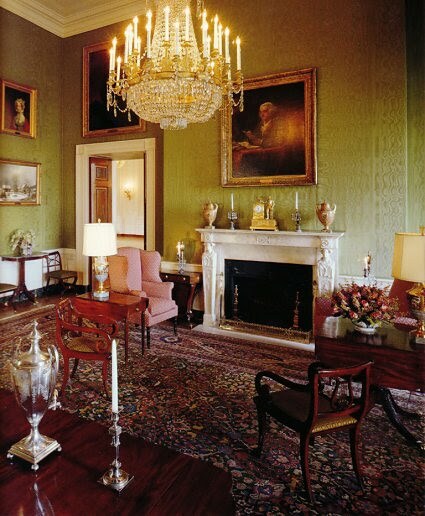 The library contains volumes by American authors and the furniture is American Federal period with a chandelier which one belonged to the James Fenimore Cooper family. 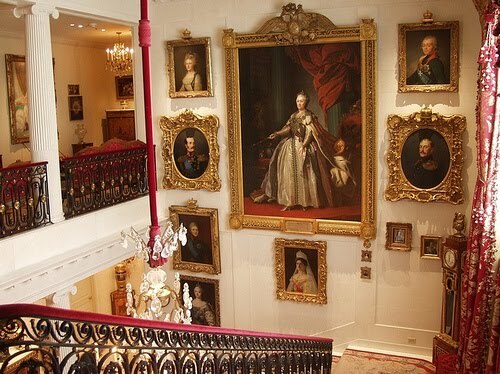 As you can imagine the Vermeil Room contains an extensive collection of vermeil (or gilded silver) and contains portraits of recent First Ladies. The China Room is one in which the pieces of china and glass used by various presidents are displayed in glass cases. The East Room is the largest of the State Rooms, used for receptions, ceremonies and press conferences. It has been the scene of several weddings and some presidents have lain in state here. Three elaborate glass chandeliers dating from 1902 hang here and one was being cleaned, involving four people who were dismantling, cleaning and repairing the links. 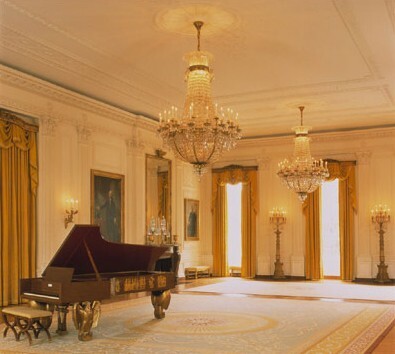 The unique grand piano was built in 1938 by Steinway & Sons especially for the White House, with input from Franklin D. Roosevelt. The next three rooms are smaller and used by the President to receive guests for smaller receptions or teas, each of them decorated in and named after a specific colour. The first of these is the Green room. Eleanor Roosevelt received Amelia Earhart in this room and it was considered by John F Kennedy to be the most restful room of the State rooms. It is furnished with pieces made in New York by Duncan Phyfe about 1810. 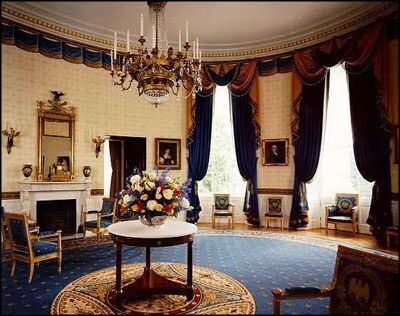 The Blue Room has a distinctive oval shape and is furnished in the French empire period, representing James Monroe’s time in office. The White House Christmas tree is placed in this room. 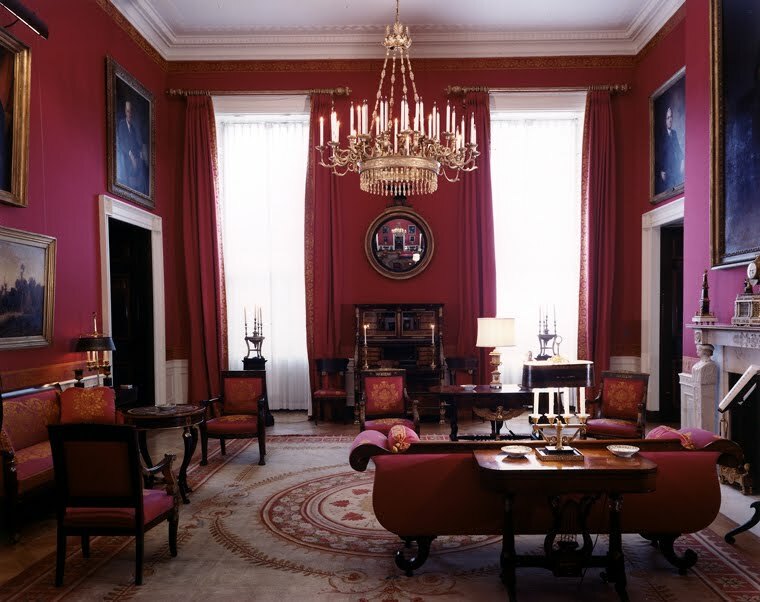 The third of this group is the Red Room which is furnished in the American Empire period of 1810 to 1830. This room was the site of the fashionable Wednesday evening socials hosted by Dolly Madison. Anyone who knocked on the front door on this night was invited to this room to be entertained by Mrs Madison. Well I think we all hope that prayer would always be true. I thoroughly enjoyed this tour and the information imparted by the knowledgeable guides. Afterwards we went to take morning coffee at the outdoor coffee shop of the Willard Hotel which is just across from the White House while we gathered ourselves to tackle one or two of the Smithsonian Museums which I will tell you about at a later date.